I realize not everyone can find a garden window on the side of the road but I did. At first I didn't know what we'd do with it but it was only about a block away, my husband happened to be home as I drove up after I saw it and the neighbor was out too and he has a pickup truck. It was like the stars aligned for us to have this awesome treasure. After it leaned against the fence all summer, we finally decided it could be a cold frame to sit on top of one of our raised beds so we could start some vegetables early. I think this bed is going to be for our salad makings so it'll be nice to get a jump on some mixed lettuce, bunching onions and carrots. 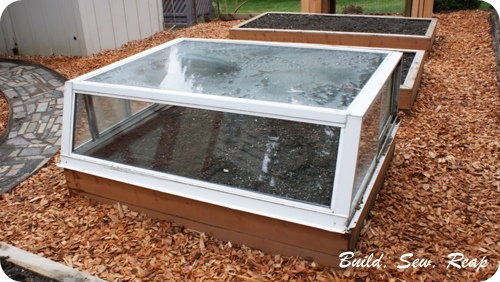 The windows on either side open so we can still water it although I plan to send a soaker hose in so I don't have to work too hard to make sure the soil stays moist. For more intense work, we can lift it and set it to the side while we work. It seems to keep the air inside anywhere from 10 - 30 degrees warmer, depending on the sunshine. Either way, it won't frost in there so I'm looking forward to watching our first vegetables sprout. So awesome! Love when the stars align for free stuff! It looks pretty big, wonder if down the road you could turn it into a greenhouse roof?